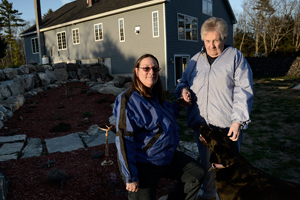 Mary Sweet: It's not easy being a senior in Maine, which isn't meeting the needs of its older residents. Liz Havu: Caregiver, mother, daughter, wife. She's all of the above - and then some. 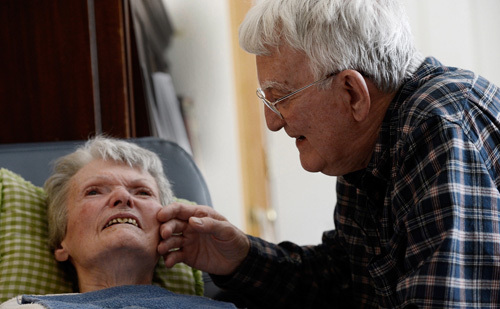 Kathy and Larry Roy: Twenty years after an Alzheimer's diagnosis, she clings to life in his tender care. Cedric and Pauline Long. Suffering from a costly betrayal. Start here to get answers to your questions. Maine has one of the highest incidence of falls in the U.S., and yet the potentially lethal accidents frequently go unreported. SCARBOROUGH — Faith Strachan has fallen a few times. The worst occurred a couple of years ago, when she was leaving a local fish market, carrying some fresh haddock for a chowder. It was a misty day, the stairs were slippery and she tumbled. The fish, her glasses and her hearing aid went flying. She wound up face down on wet cobblestones, a bit bloody and bruised but not seriously injured. “It was a good wake-up call,” said Strachan, who lives in the Piper Shores retirement community with her husband, Ralph, a retired supermarket executive. Both are 92 years old and were avid skiers in their younger years. 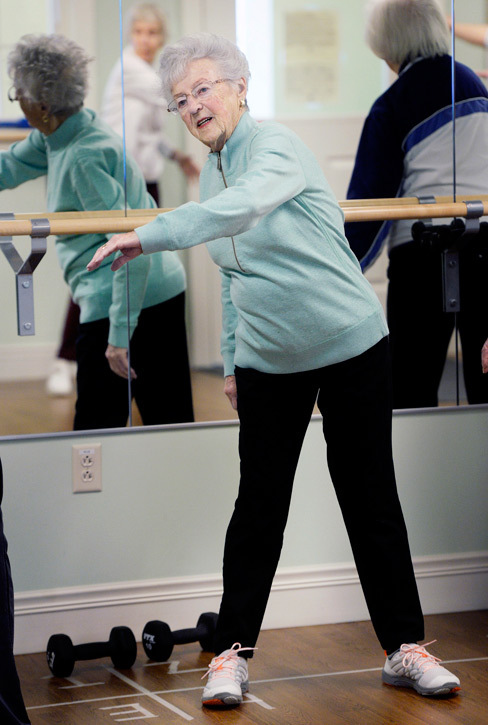 Heeding that wake-up call, Faith and Ralph Strachan regularly attend exercise and balance-improving classes offered at Piper Shores by the U-ExCEL fitness program for older adults, which was developed at the University of New England’s medical school. Exercising with a doctor’s approval is one of the best things a senior can do to prevent falls and avoid becoming part of a harrowing statistic. Maine has the 8th-highest incidence of falls in the nation, with 18.2 percent of adults age 65 and older reporting that they fell within the last three months, according to America’s Health Rankings 2013 Senior Report. Falls are the leading cause of both fatal and nonfatal injuries among seniors, resulting in $30 billion in direct medical costs in 2010, according to the U.S. Centers for Disease Control and Prevention. 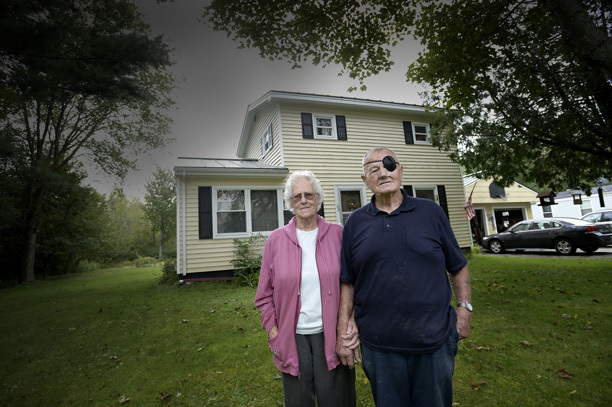 In Maine, the average cost of a fall is $16,000. Many falls go unreported. It’s estimated that one in three seniors falls each year, yet less than half of them tell their health care providers about it. Hospital emergency departments treated 2.3 million U.S. seniors for nonfatal fall injuries in 2010, and more than a third of them were admitted for in-patient care. At Maine Medical Center in Portland, the state’s largest hospital, the emergency department sees at least one senior who has fallen during each shift, said Dr. Robert Anderson, a professor of emergency and internal medicine in the Tufts University School of Medicine’s clinical program at Maine Med. Anderson and other experts say falls are a serious problem for older Mainers not only because they can cause serious injuries. 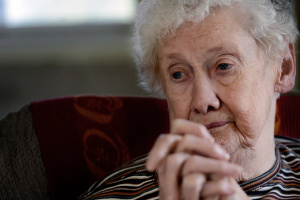 They also make seniors fearful, which often leads to inactivity, isolation and greater health problems. 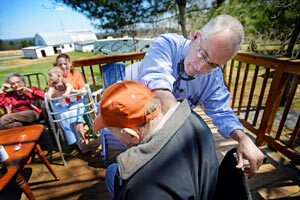 Falls also can accelerate the need for long-term care and, in the worst cases, result in death. In addition, falls usually indicate related health problems, such as vision changes, increasing balance and mobility issues, and underlying health concerns ranging from dangerous drug interactions to seizures or strokes. 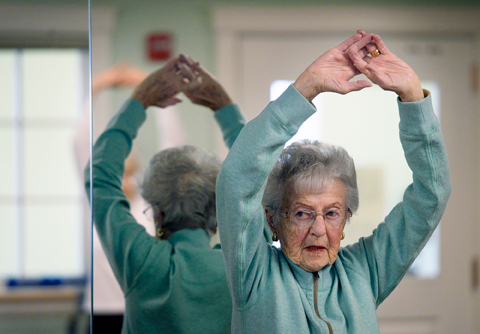 Seniors work to improve their balance as they exercise in the U-ExCEL fitness program at Piper Shores in Scarborough. To the far right is 92-year-old Faith Strachan who after falling a few times, decided to start regularly attending exercise and balance improving classes. 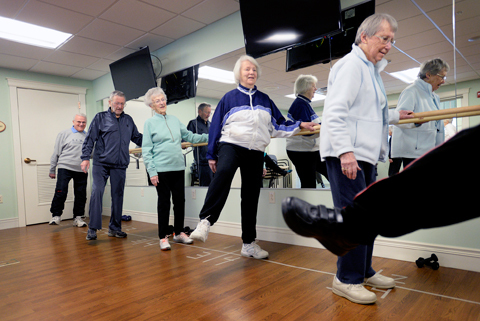 Fall-prevention programs offered locally include U-ExCEL’s Balancing Act, a progressive slate of exercises that target various muscle groups to improve balance and reduce falls, said Anne Cowles, U-ExCEL’s fitness director. 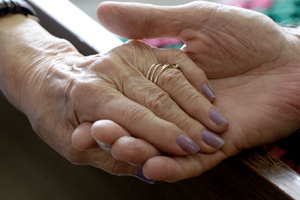 She developed the program with Marilyn Gugliucci, Ph.D., director of geriatric education at UNE. 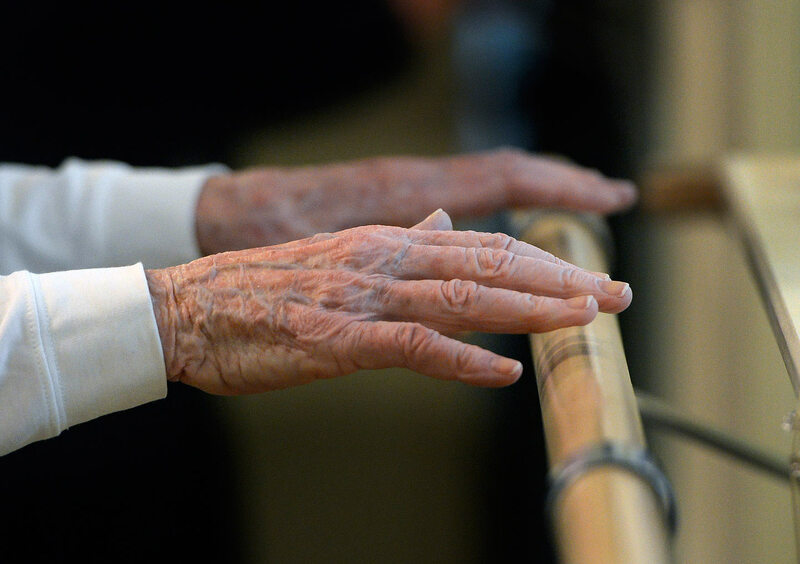 The program recently received a $380,000 grant from the National Institutes of Health to study the benefits of a fall-prevention program for visually impaired seniors, who are twice as likely to fall. There’s also A Matter of Balance, a nationally recognized, eight-week instructional program designed to reduce fear of falling and increase strength and flexibility. MaineHealth, Maine Medical Center’s parent organization, administers a training program for A Matter of Balance instructors across the country. To avoid falls, seniors should be candid with health care providers about any balance or mobility issues they may be having, said Dr. Heidi Wierman, a geriatrician at Maine Med. They also should have their medications reviewed for potential drug interactions that may cause dizziness or other problems, and they should see an eye doctor regularly, Wierman said. Seniors who have balance and mobility problems should avoid risky behaviors, such as using a kitchen chair as a step stool. And they should remove hazards around the house that may cause falls, such as scatter rugs and exposed electrical cords, and consider moving to a home with few stairs. Wierman acknowledged that it’s not easy for most people to change long-held habits. 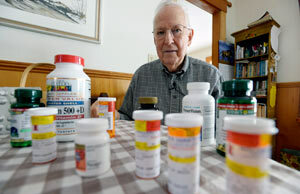 Taking multiple drugs and supplements is common among Maine’s aged, ‘a necessary chore.’ It’s up to doctors, pharmacists, caregivers and the patients themselves to ‘treat carefully’ and avoid risks. Copyright ©2013 MaineToday Media, Inc.